way until she went into labor practically. Crazy! Photo found here. The number one reason I hate the gym? Boredom. Endless swings on the elliptical, miles on the treadmill, crunches, curls, squats… What a snooze fest. For awhile, I employed a trainer and that helped. No boredom when Cute Trainer Dude is forcing me to do stupid human tricks like “earth worms,” “burpees,” “crab walks,” speed ladders and kettle bells in rapid succession. But I never felt at home, if that makes sense. So I tried Bikram yoga. Definitely solved the boredom problem but man is it expensive and time consuming. A 90-minute class became almost a 3-hour commitment with travel, warm up and cool down factored in. Although I love it and will probably go back in the future, I just can’t afford the time or cost at this juncture. What to do, what to doooo. Enter group fitness classes at the gym. 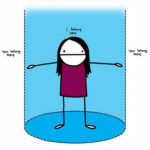 After Bikram, I can’t really explain my aversion to group fitness classes. I suppose I was nervous to walk in the enclosed glass room, nervous to look foolish, nervous that I might not be able to keep up. But I finally sucked up my fears and tried my very first class last week: R.I.P.P.E.D., which stands for Resistance, Intervals, Power, Plyometrics, Endurance, and Diet. R.I.P.P.E.D. turned out to be a cardio/strength/interval extravaganza set to obnoxiously loud music led by a high intensity string bean wearing a too-loud microphone. Although I initially felt like an idiot hopping around, I settled in. I could barely walk the next day (and for the next three days) and I was definitely not bored. Although time will tell, it feels like the closest thing to personal training I’m going to get without paying a boat load. But it’s not fun. Although I like it inasmuch as I think it will help me finally fit in my jeans, and it’s challenging enough to keep me interested, I’m not inspired. It feels like dance without the artistry and personal training without the specialized attention. with Salsa, Merengue, Samba and grapevines as least! Photo found here. So next I tried Zumba, cardio-dance with Latin inspiration. 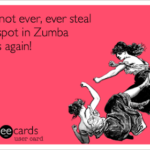 Zumba, where have you been all my life? In an instant, my decade+ of dance training came flooding back and I salsa-d, bebopped, body-rolled and booty-shaked my way into the most fun I’ve had in a long time. I must have looked ridiculous, but I couldn’t stop smiling. And you know what? An hour of Zumba burned 650+ calories according to my bodybugg. I can’t do that on the damn elliptical machine! 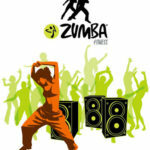 So, I confess, I am head over heels in LOVE with Zumba and I can’t wait to go back again this weekend. If you get a chance, I highly recommend trying it. Although be warned, it is fast… very, very fast and at least at my class, the instructor doesn’t really teach the moves. That said, who cares if you have the moves down… get out there and shake your buns… off as the case will hopefully be. If Zumba fitness is your New Year's goal... don't stop dancing!